Are Drones A Fad Or Here For Good? Editor’s note: Philip McNamara is the managing director for outsourcing firm Voxpro, a venture partner with Enterprise Equity and creator of the Drones and Data X Conference in Santa Cruz. Drones are no longer just seen as a tool of the military or a toy that people use to fly around. They’re becoming accepted as a tool that businesses can deploy, and every day more and more companies are being created to build drone prototypes and software to help them fly, detect obstacles and make sense of terabytes of data they collect. This is the golden age of drones, and it is just taking off. Take consumer perception — “drone” is a household word. Just look at the Google Trends for the word “drones” or “DJI.” Check out the number of drone videos on YouTube (~827,000). According to Frost and Sullivan, an aerospace research firm, over 200,000 drones were sold each month in 2014. Parrot, a french drone maker, reported sales of over $47 million in drones in 2013. Whether we like it or not, we are going to be seeing more drones in the sky and on the news, and they will get cheaper, faster and more reliable. Here, I want to go into some reasons why I think drones are not just a fad but are here to stay. While still not commonplace, drones are beginning to appear in many different industry settings, where their ease of use and huge costs savings over traditional methods, it makes it a no brainer for companies. Construction companies are not always first movers when it comes to new technology, but when it comes to drones, they have really taken a liking to them. Companies like Bouygues, Balfour Beatty and Webcor are using drones to map construction sites. They are employing drones made by Skycatch, which recently made a deal with Japan’s Komatsu to enable driverless bulldozers to take instructions from unmanned drones. You may not have known it, but you’ve probably already seen a lot of footage taken by drones on TV. Big brands like Walmart, BMW and Nike have taken videos using drones. Video production companies have been very quick to use drones to get difficult-to-reach shots. Modern drones now use steady-cam like gimbals to make videos look super smooth. As drones get more sophisticated, expect to see more drone-made movies. Farmers are increasingly using drones to monitor crop health and gauge growth patterns. This is a job well-suited to drones, as previously helicopters would have had to do this job, at great expense. Companies like Precision Hawk are developing software and hardware that automatically measures the height of crops and detect weeds, and they can even count plants. These kinds of drones are using fixed wings, which mean they can stay in the air for much longer, and capture a lot more data than a DJI-like quadcopter. Jay Bregman, the former CEO of Hailo, isdeveloping verified database of drones, that will allow people to know where you can and cannot fly a drone. 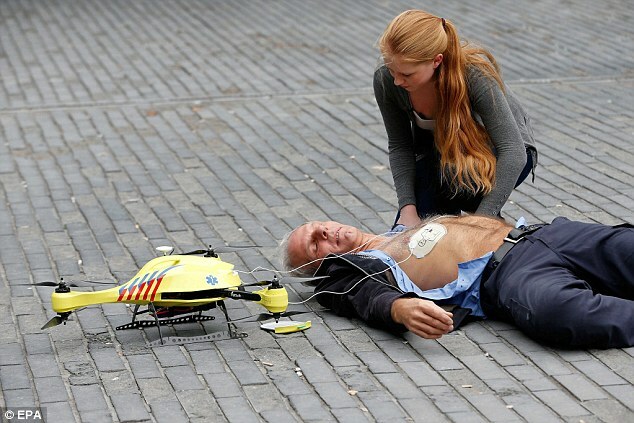 Many of you will have seen the defibrillator drone, which is still an idea, but could be a reality very soon. These kinds of drones could be useful for cities with dense traffic. A drone like this could fly across heavy traffic and deliver life-saving equipment in under three minutes. For places with no roads to speak of, companies like MatterNet are creating drones that will deliver medicine. Then there are drones that will deliver life vests to drowning victims, or when a life guard can’t get to a person on time. The average human takes 90 seconds to reach and save a drowning victim who is 75 meters from the beach. It takes a drone 22 seconds. Why send a human into a blazing inferno, when you can send a robot? Drone America, a company based in Reno, Nev., recently unveiled a drone that can capture heat signatures, analyze the chemical, biological, and radiological threats before someone actually gets to the fire. Police have been buying up drones for years now, as the cost of running helicopters is very high compared to sending up a drone for a short period of time. Whatever you think about the surveillance state, drones will continue to be used by law enforcement and security forces. The idea of a drone taking you to work is still a Jetsons kind of idea, but there’s one company in Santa Cruz, Calif., that plans to kill your commute. Joby Aviation is building an ambitious aircraft: A personal craft that can lift off vertically, fly 200 miles and land vertically, all on battery power. While still several years away, the technology this company is developing could pave the way for new advances in personal transportation. I took a visit to their HQ and was blown away by the work they’re doing on VTOL technology, propellers that adapt and huge carbon fibre wings. Some people think that drones could be the next trend in personal transportation. While this is some ways off, I would love to believe in this dream, as would millions of commuters. Battery power and battery weight will have to improve dramatically, safety systems will have to be developed and anti-collision infrastructure will have to be deployed. The promise of personal drones is one where you’ll jump into some kind of craft from your rooftop, punch in your destination via Google Maps, and be driven by a computer, guiding your destination while avoiding all other air traffic. You’ll leave roads, traffic lights, traffic jams and accidents behind. This leaves us entrepreneurs with some challenges. Think about the huge opportunity of drones in the future, and what kind of software and hardware will have to be developed to manage that growth. There are very few companies out there today creating software to make drones safer. What about systems to manage where drones can and cannot legally go? How will we know who owns a drone when the next one crashes into a famous person’s lawn? There is no equivalent of the DMV for drones yet, or safety belts or airbags. Drones could spur demand for lighter batteries or a different kind of power source. Drones need to see where they are going and avoid obstacles, and software is going to have to be built to make all of these dreams a reality. There are so many great applications for drones, we haven’t even begun to scratch the surface. Whatever happens, drones are here to stay.